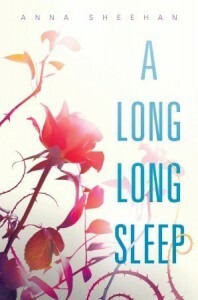 A Long, Long Sleep is, as the title suggests, a fairytale re-imagining of the Sleeping Beauty story. However, this story is about so much more than a princess who is trapped in a castle; instead, it's a futuristic, sci-fi story about a girl who comes to some unpleasant realizations about her life, and becomes her own person. It tackles many heavy topics, including loss and grief, and causes you to do some critical thinking about what constitutes emotional abuse. For the first half of the book, I really wasn't fond of the protagonist, Rose. She was far too passive and self-deprecating. She fell in love far too easily, and was too awkward and shy to make any friends. She didn't ask nearly enough questions, despite waking up in a whole new world, and apologized far too much for things that weren't her fault. My opinion completely changed halfway through the story when the reason why she behaved like this was brought to light. As Rose discovers the harsh truth about her parent's actions, she learns that she doesn't necessarily need someone else to come and save her; she's more than capable of doing that on her own. She makes friends, discovers her talents, and finds a reason to keep on living. Her transformation was heartbreaking but necessary, and I can't wait to see how she fares in the future. Although Rose was immediately attracted to Bren, this case of instalove was an exception to my dislike for the trope: the reasoning behind it was really well explained and, for once, the boy doesn't fall head over heels for some girl that he doesn't even know. Rose experiences rejection and heartbreak, just like any normal girl, and has a multitude of important relationships, ranging from romantic to familial. The world building wasn't the most detailed, but that was more than okay considering that the focus of the story was more on Rose's character development than what happened to the world during the Dark Times. The sci-fi technology was primarily the vehicle used to explore the topic of child abuse, but that's not to say that it wasn't interesting; between stasis tubes, killer cyborgs, and hovercars, I kept wanting to learn more about this technology. Hopefully that will be explored further in the sequel, though I really wouldn't complain if Sheehan decided to write a book that took place during the Dark Times. Overall, A Long, Long Sleep is one of those books that snuck up on me. I enjoyed the entire story, but wasn't fully captivated until the second half of the book - and, by then, the combination of Rose's emotional journey and the neat futuristic technology kept me from putting the book down until the very end.